What are the qualities of truly successful leaders? How does an understanding of Sikhi prepare leaders? Will I be called to become a leader in my community? Have you found yourself pondering these questions? If yes, there is a place to explore the answers! There, you will find a community of support and inquiry that will make your time at Sidak a rich and fulfilling journey. A community draws its power from the development and education of its members. In an effort to strengthen the core of the Sikh community, SikhRI offers a variety of educational programs and seminars to facilitate this growth among Sikhs of all ages and in all stations and phases of life. To develop leadership, individuals displaying potential in shaping the community are provided with ideological, behavioral, organizational, and managerial skills. SikhRI recognizes that each sector in the community has specific needs that must be met. Therefore, specific training and development meets those needs while increasing the relevancy and effectiveness of informational sessions and modes of education. 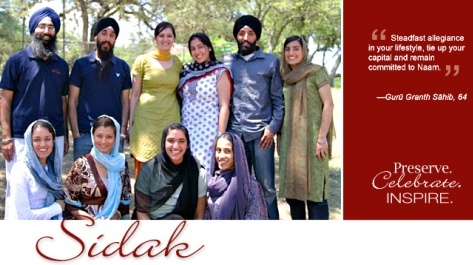 The Sikh Research Institute offers Sidak, a distinctive leadership development program for young adults seeking to increase their commitment towards the Sikh faith. A two week intensive immersion in Sikh culture, language, values and community though understanding bani (scripture), tvarikh (history), and rahit (discipline), held annually in San Antonio, Texas. Sessions on leadership development and community building also serve as key foundations for Sidak. Sidak-ers find that the bonds they form with their instructors and other students will inspire them towards activism long after the program ends. Home cooking and the Texas Hill Country enrich the experience. This unique learning opportunity will help you discover your inner-self, build stronger relationships, and infuse the Sikh spirit. Part of the Sikh Research Institute’s mission is to facilitate training and development while inspiring Sikh values. Through the annual summer Sidak program, we work towards that goal by creating ideologically strong leaders for our community. The approach is through an understanding of the academic, historical, and religious traditions of Sikhi. To ensure an event of the highest caliber, the Sikh Research Institute has secured several facilitators for the Sidak program who are regarded as experts within their respective professional fields such as human rights in South Asia, classical Sikh musicology, Sikh theology and history, Gurbani linguistics, Leadership, and contemporary issues concerning Sikhs in the Homeland and the Diaspora. Three separate programs are offered simultaneously: one for first time participants, one for returning students, and a language program that is open for all students and adults. Sikhi 101 study an overview of Sikh history and theology through structured learning, while Sikhi 201 students delve deeper into the same subjects through a more rigorous exploration. The Language Program will focus solely on the composition, structure, and language of the Guru Granth Sahib. If your questions were not answered through this document, please feel free to contact us at sidak@sikhri.org .